Watching Callum Paterson collapse in a crumpled heap by the Tynecastle touchline two weeks ago, you could almost hear Craig Levein’s sigh of dejection from the directors’ box. Serious cruciate and medial ligament damage to the player’s left knee left all concerned devastated. The injury will cost Paterson nine to ten months of his rapidly prospering career. It also robs Hearts of a potential £1million sale this month. At the very least, director of football Levein and the club hierarchy will likely be denied a £400,000 development fee for their prize asset this summer. Paterson isn’t expected to be fit until September at the earliest, so leaving his formative club as planned in June when his contract expires would be a risky, if not crazy, strategy. The ideal solution is obvious: Hearts officials, Paterson and his representatives gather round the negotiating table and thrash out an agreement to extend the 22-year-old’s contract. He had previously refused all such attempts, certain in his mind that his future lay in England. However, the landscape changed dramatically two days after Christmas with that horror moment against Kilmarnock. An added complication is that Hearts are only entitled to development compensation for the Scotland full-back until the end of the season of his 23rd birthday – which is next season. A new, long-term deal would, therefore, mean he could leave for absolutely nothing when it ends. For now, all parties have agreed to wait until after he has surgery on the injury next week. They will then reconvene to discuss whether a new contract to protect both player and club might be possible. 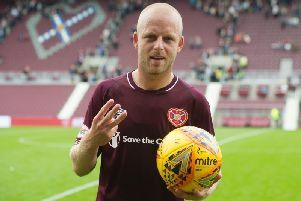 “I would like Callum to sign here longer on the back of what has happened,” stated the former Hearts defender Jimmy Sandison, a regular commentator on the club’s internet TV channel. “It would make sense to get round the table quickly because it is going to be an awkward period for him. All the bargaining power is on Hearts’ side now. They need to see how the op goes as well so I think it makes sense for him to stay where he is and move at a later date. “Before his injury, he was a certainty to go. The big boys had been watching him and there would have been a couple of good offers. With this injury, they will now think, ‘hang on a minute,’ and step back a bit. That is really sad for Callum. “I think he is a first-class player, I’ve said that many times. I tipped him many years ago to take over from Alan Hutton with Scotland and he proved me right, so I really feel bad for him. There is nothing worse than a big injury like that, at that moment in time, where he could have made a few quid and gone on to something. “The medical team here will help him come back, I have no doubt about that. Hopefully they will get him back stronger. Where does go from here? I don’t know. Will one of the big boys take a gamble with an injury like that? I don’t know. I think it would make sense to stay here for at least another year and get himself back to where he was, rather than take the gamble. I don’t know if a club would take him with that injury. It’s a difficult one. “It’s a horrible situation. If it was me I don’t know what I would do. I would probably stay with my parent club to try and get myself fit again. They’re the ones who are rehabbing him so, out of courtesy, I would probably stay for another year or so. Levein told shareholders at Hearts’ AGM last month that Paterson would not be sold in January for less than a seven-figure sum. Attempts to convince him to stay had proven futile and there was a general acceptance that he was going. “Both parties would have been pleased if he had left this month. Hearts would have received a decent amount of money and he would have been able to progress his career,” said Sandison. “That’s fine, there’s no point keeping players at a club they don’t want to be at. If they want to move on, if they want to chase the bigger bucks, that’s absolutely fine. So it came at the worst time. Paterson has rightly needed time to digest this latest blow. Previous knee and shoulder injuries sidelined him for several weeks rather than months. This is new territory. He will know suitors in England aren’t going to offer him a move until he is fully rehabilitated. “I don’t think you can start handing him a three or four-year deal and hope the injury will completely go. I think you’ve got to take a step back,” continued Sandison. “I wouldn’t be happy as a manager trying to buy Callum hoping he will come back. He might not. I hope he will and he probably will do but you just never know with these kind of things. “I go back to Craig Levein. He had the same kind of injury as a player. There are all sorts of question marks that might just put big buyers off at the moment. They’ll be watching with interest so I think he would be better staying here for another year. “If you want to go to a new club you want to be going in there feeling good about yourself. You don’t want to go in and head straight to the treatment table. You want to go in and set a wee marker down and say, ‘I’m a player here,’ and kick on with your own career. Paterson’s misfortune not only denies Hearts an experienced international defender. He is also their joint-top scorer alongside Jamie Walker with ten goals so far this season. “I think he is a great defender as well as one of our top goalscorers,” added Sandison. “Liam Smith was always going to be his natural replacement and for me Liam is a wonderful right-back. When Callum went off against Kilmarnock and there was a free-kick for Hearts, Liam trotted over to the middle of the park and defended whereas Callum would have been in the box trying to win the header. So you miss that. Seeing where any prospective contract talks between Paterson and the Hearts hierarchy go over the coming weeks will be just as interesting.